Will Pedestrians Swoon Over Art on a Wall? On a recent Tuesday morning I’m sitting on the sidewalk on the east side of Hampshire Street, my back against an apartment complex, looking directly across the street at a blank brown wall. Two pigeons hobble in syncopated circles beyond my sprawled feet, picking at things that aren’t food. A parks department truck pulls into a metered parking spot in front of the wall and idles. The driver spreads a New York Times newspaper over the steering wheel. A man in a cowboy hat drops his laundry off at Zheng’s Cleaners, just left of the wall. The truck pulls out. The man leaves. No one looks at it, this wall. It’s brown — mundane and quotidian, blending seamlessly into the cityscape. 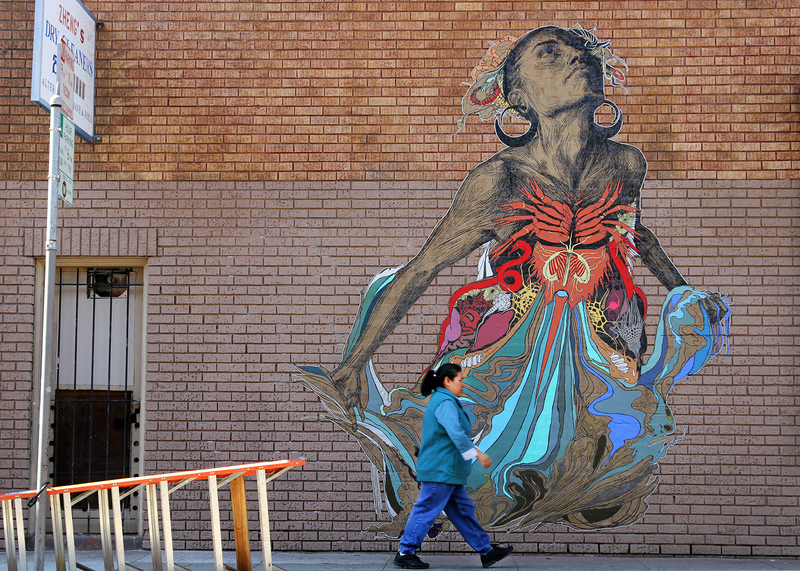 But in an hour, cohorts of the internationally acclaimed street artist known as Swoon will arrive. They will install a nearly 10-by-12-foot wheatpaste, a colorful rendition of the Greek goddess Thalassa that is, as my colleague reported, Swoon’s meditation on the oil disaster off the coast of New Orleans. By 1:30 p.m., a gorgeous wheatpaste adorns the once-blank wall. And by 2:30 p.m., the crew and spectators have cleared out, and all that’s left is the wheatpaste and a wet puddle of sludgy solution on the cement below. I’m curious how the piece will transform the space, whether this work of art will proffer new interest and relevance to the people who pass it. Whether idling drivers will look, or locals will stop. Does art make a difference to the people who stroll by here every day? On Sunday morning I return and reclaim my patch of cement across from the mural. I sit, and watch. But for three hours, it’s again just the pigeons and me. Almost no one stops to consider the woman on the wall. I watch people approaching the piece from 24th Street and those coming up Hampshire Street. I look hard at the very corners of their eyes, to see if the figure or the color attract them for even a moment. Some eyes glimpse the piece, but for fractions of seconds, at eye level, not bothering to take it as a whole. They certainly don’t digest it as a work of art, or contemplate it. I’m reminded of a barrage of Facebook posts about Joshua Bell, the world-famous violinist, who played anonymously in a Washington D.C. metro stop. No one really stopped to look, to listen, to recognize art that the music critics consider sublime. The sun is setting. And finally, Catherine Lee, a Mission resident of 20 years, stops in front of the piece. I ask her why, and she says that she’s a firm believer that the community must communicate through posters and wall art. Back in the ’70s, she says, the community didn’t have access to the press, and this is a cultural means of communication that’s still important. The sun has set. It’s too dark for the piece to communicate now. I return on Monday. Much like Sunday, there’s little fanfare, though a few stop. “I’ve been to Mexico, and read about the murals in the SF guide,” says a woman visiting from Florida. And this particular piece, I ask, what drew you here? The owner of Precita Eyes told her not to miss it. Thirty minutes later another duo stop, this time travelers from Europe. They like it; they also use the word beautiful, and say “it’s the tradition of the area.” Again, they heard about it from the owner of Precita Eyes. I’m a bit perplexed. Locals aren’t stopping. Two young men who have passed the piece multiple times over the course of my stake-out come by again. I stop them and ask them what they think. The other says it’s scary, not like the other pieces in the Mission. Can an artwork’s impact be measured or understood? In his Washington Post article on Joshua Bell, Gene Weingarten argues that because no one stops to appreciate art doesn’t mean everyone’s a philistine. A commuter late for work, or ill, for example, is not encountering the mural in its optimal viewing condition. Weingarten invokes Kant to assert that whatever the work, it’s a combination of the art itself, the observer’s state of mind and his or her aesthetics that’s important. No, I say. I’m just trying to figure out if this piece has an effect on people. i live around the corner (23rd) and love it!! i just shared it online with friends who share photos of public art in various cities. most folks are too wrapped up in their cell, text, ipad, virtual worlds to enjoy the real wrold… oh well. I always stop and take in this art when passing by; went out of my way to hustle down from Harrison St to take a look when it first went up. If I don’t get down to that part of 24th St for a bit, I go out of my way to just go visit this piece. Several others as well. And I used to visit regularly, and miss the original Swoon piece that was here. But. . . I’m older, and don’t own a cell phone, ipod or that kind of diversion from real life. Walk more slowly – which provides an opportunity to see more.